First Listen: Steve Earle, 'I'll Never Get Out Of This World Alive' The latest album from the iconoclastic country singer, I'll Never Get Out of This World Alive takes its name from Hank Williams' final song. Hear Steve Earle's excellent new record in its entirety. 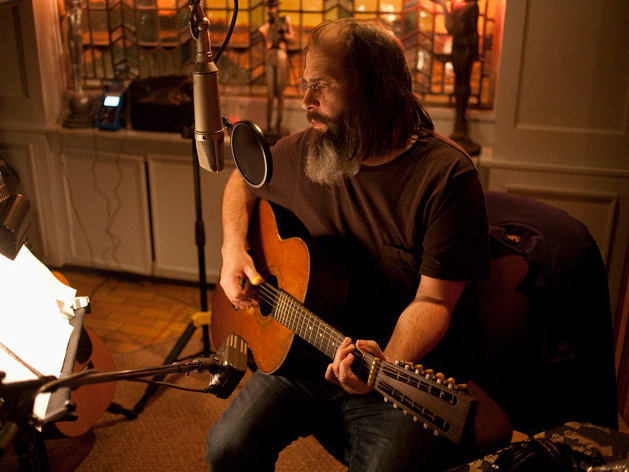 Steve Earle's newest album, I'll Never Get Out of This World Alive, comes out April 26. Steve Earle has had a diverse and checkered career, but a few common threads run through each of his records. He champions the little guy and mocks the world's self-styled titans. He paints on a canvas called "country," but makes room for folk, rock and rootsy protest music of all stripes. And he celebrates the past — generations that inspired him, performers who influenced him — without wallowing in cheap, sepia-toned nostalgia. Along the way, Earle has been an outlaw, an activist and an even an incarcerated drug offender, but he's always found his way back to music that feels pure and plainspoken. In recent years, Earle seems to have found a more comfortable place in his life — he married another uncompromising country singer, Allison Moorer, and raised one of his own in singer-songwriter Justin Townes Earle — while turning his attention to music that fuses timeless sounds with present-day concerns. In 2009, Steve Earle made a well-liked tribute to his son's namesake, a collection of Townes Van Zandt covers called Townes. For his follow-up, he's found a natural collaborator in like-minded producer T Bone Burnett. Named for the eldest Hank Williams' final song, I'll Never Get Out of This World Alive bears Burnett's familiar production stamp: It's spare and aired-out enough to give the words and sounds ample room to breathe. Fortunately, as with so many of the projects Burnett chooses, the songs on I'll Never Get Out of This World Alive — out April 26, two weeks before Earle's novel of the same name — are sturdy enough to bear the scrutiny that follows. Earle humbles a powerful man at the end of his life in the scathing but catchy "Little Emperor" ("No more pomp and circumstance, no more shock and awe / You're just a little emperor, that's all") and makes the most of Burnett's signature cool portent in the bruisingly lowdown "Meet Me in the Alleyway." Still, Earle sings with no less conviction throughout the fearless love song that follows, "Every Part of Me," in which he declares, "It's all I can do to mark / where you end and where I start." That's a far cry from the harsh Judgment Day he administers to the brutal and unkind elsewhere on I'll Never Get Out of This World Alive. But "Every Part of Me" remains consistent with the worldview the album reflects: Steve Earle loathes fakery of all kinds, so love and hate are both laid bare under the harsh light of truth as he sees it.